Your Roomba is dead or just acting strange and you don't know why or how to fix it. We are here to help! Our FREE Roomba diagnosis service will quickly help you determine what is wrong with your Roomba and how we can fix it. All you have to pay for is shipping or drop-off for free at our Massachusetts repair center. Questions or don't see the model of your Roomba? Call 1-855-FIX-ROBOT or contact us here. Place your order and ship your Roomba to our service center. We can send you a box and/or prepaid shipping label to make things as easy as possible (additional charges may apply)! Our technicians perform a battery of tests to pin-point the problem and then will send you a detailed repair quote. You authorize the repair: We will repair your Roomba, and ship it back using your selected shipping method. You decline the repair: We will ship back your Roomba using your selected shipping method. We are also happy to recycle your Roomba for you at no additional charge (return shipping will be refunded). 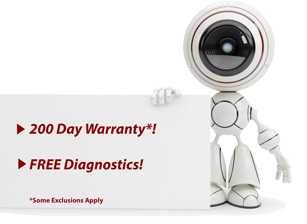 Repairs are backed by our 200 day warranty (some exclusions apply, see warranty for more details). We offer the best warranty of any Roomba repair center! Select your model of your Roomba, place your order, and ship your Roomba to our service center. We can send you a box and/or prepaid shipping label to make things as easy as possible! Our technicians perform a battery of tests to pin-point the problem, and then will send you a detailed repair quote within 24-72 hours of receipt of your Roomba.